We can never deny that Globe Telecoms is the leader when it comes to BlackBerry deals. PostPaid BlackBerry plans would start at Php 499 for the Curve 9220 and Php 999 for the latest Curve 9320. However, in the attempt to keep up with the competition Smart Communications is now slashing the price of the existing BBM subscription to Php 599 a month (previously Php 1200)! Furthermore, Smart also trimmed its BBM Only Plan to Php 99 from Php 150 with 15-minute worth of net voice form Postpaid subscribers and 10 minutes on Prepaid lines (dial *2207+11 digit number). 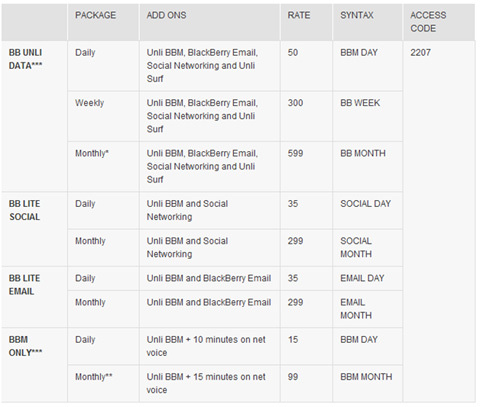 Smart has also improved it other BBM services such as Lite Social, Lite Email and BBM Only. Check details below for complete information.